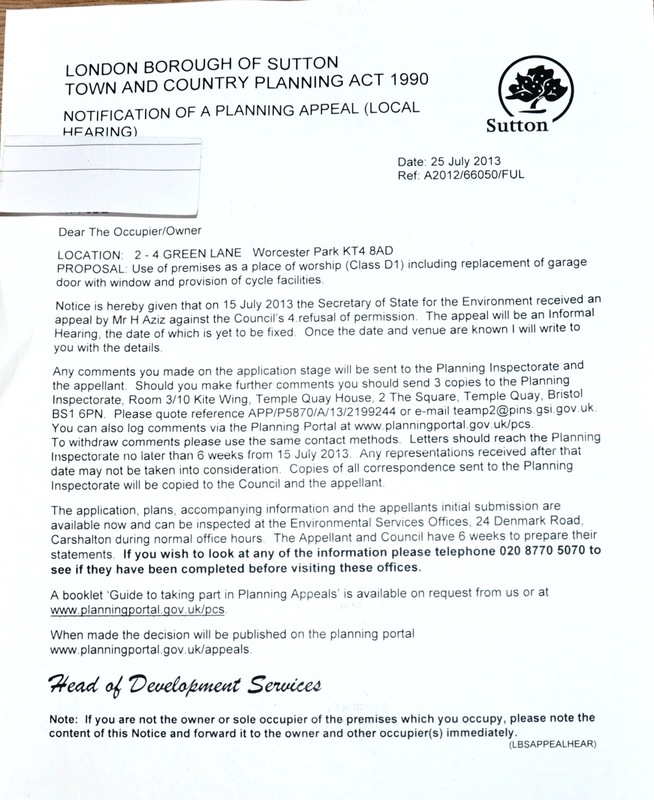 We have 6 weeks from the 15th July to send in further comments to be taken into account by the appeal hearing. As it is now over two weeks since the 15th, this means we have less than 4 weeks. 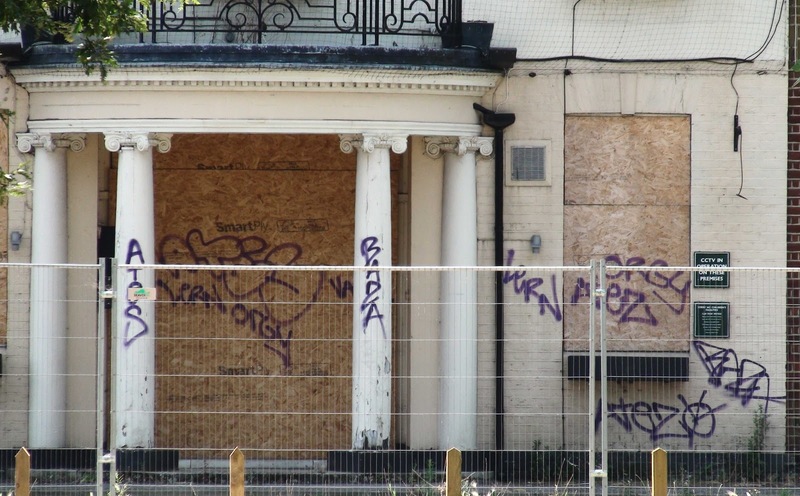 Readers will be aware that the same applicant has recently submitted a second application to turn the building into a Mosque. While to most people this is a second try at the first application with a few adjustments, the blog understands that in the eyes of the law it seen as a completely new, different and unrelated application. 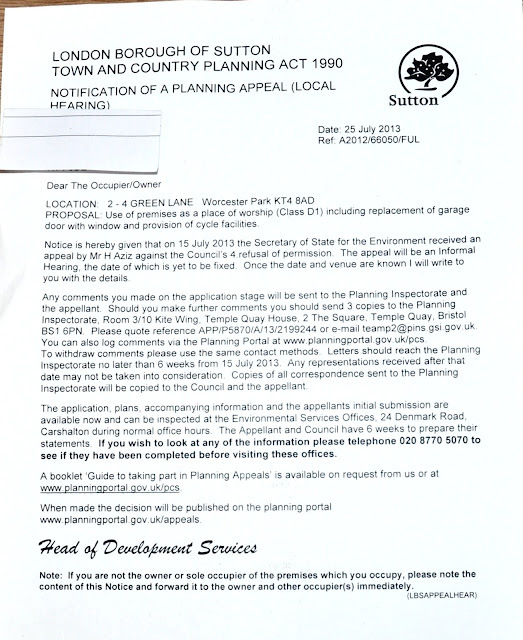 However this appeal is not about this new second application, it is going back to the first application which was refused by the Council back in December last year and asking for this decision to be overturned. The fact they are appealing one decision while putting in another application for pretty much the same thing makes it seem a bit complicated though. If you can remember back to the original application, which was turned down because of the traffic and parking problems it would cause (before any talk of a Green Mosque prohibiting the use of cars), this is the refused application they are appealing against. 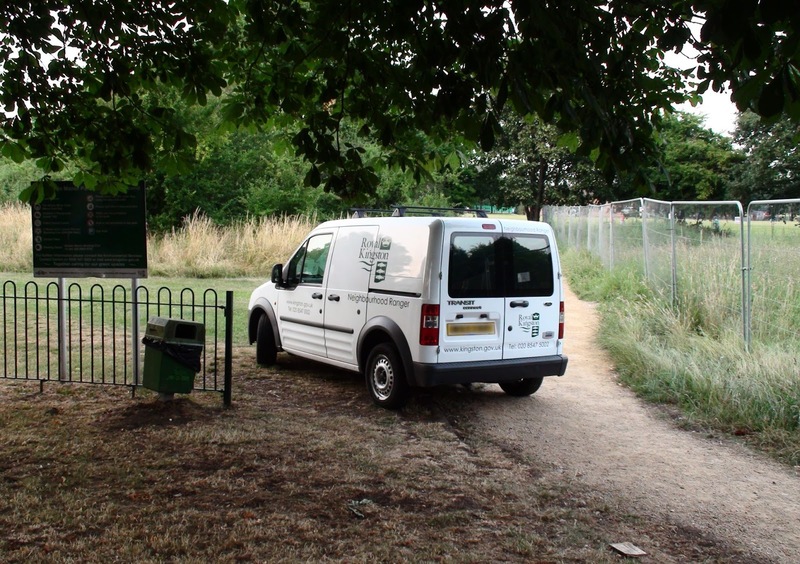 A stolen mobile phone was tracked down to bushes by the tennis courts at the Athletics club in Green Lane by police using a phone locater application. 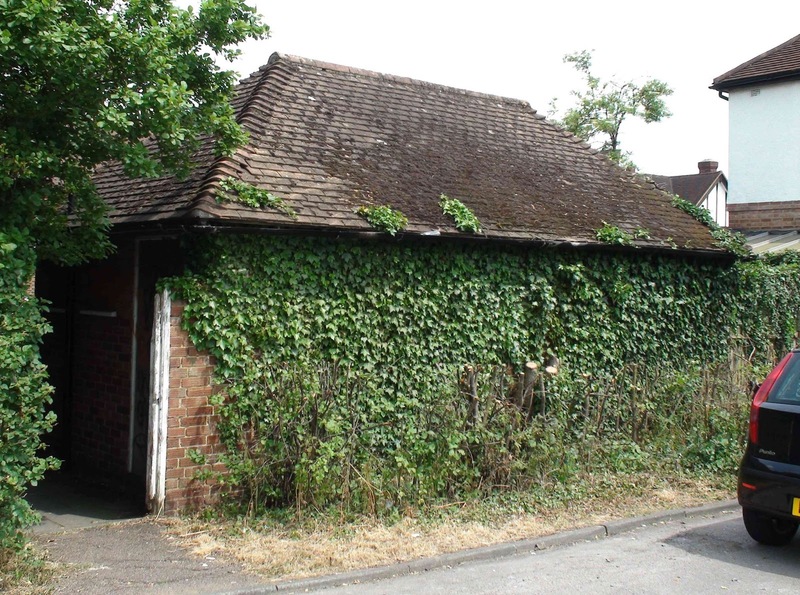 The iphone, which was stolen from a teenage girl at McDonald’s in Cheam after her prom night on the 13th July was found discarded in the undergrowth near the tennis courts, possibly thrown from one of the platforms at Worcester Park station. The girl, a student at Cheam High School, activated the ‘find my iPhone’ application for the phone after it went missing. The officers first thought it was in a residential road on the other side of the station. But when officers re-ran the tracking application they found that the phone was located on the opposite side of the tracks. With the battery life on the victim’s phone fast running out, officers started to search the area at the rear of Worcester Park Sports Club on Green Lane where the phone seemed to be. Officers set the application to prompt the phone to make a sound and found it in bushes by the tennis courts. 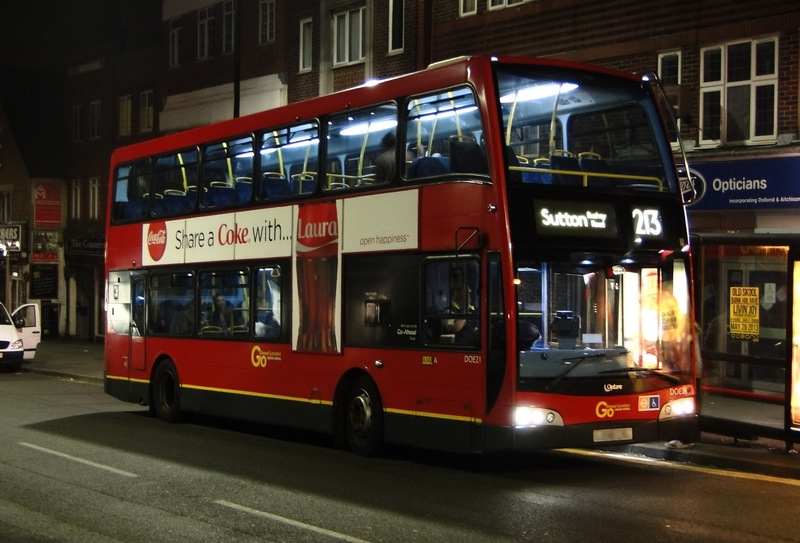 How much do you know about the 213 bus? 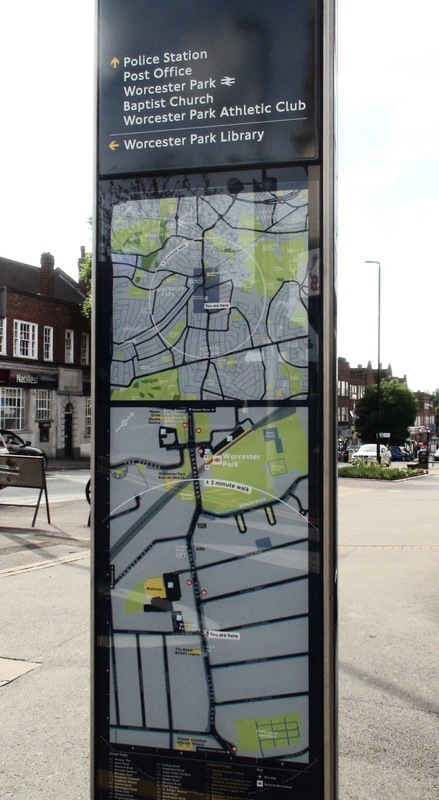 Amy Graham is an MA student at Kingston University and is researching that very subject. Amy is doing a course called 'Heritage: Contemporary Practice' and also happens to work for Kingston Museum and the Heritage Service. For her MA individual project she has decided to collect information, memories and stories about the 213 bus and would like to hear from any blog readers with interesting information or good stories about the 213. Amy also has a blog on the subject which is www.213bus.wordpress.com. She is also looking at other themed trails such as 'World War 213' and even a little celebratory exhibition if she can collect enough material. So if you dear reader can help shine some light on the history of the 213 bus and related information please let Amy know. You can contact her directly at 213bus@gmail.com or through the blog. Or better still share your memories on here! 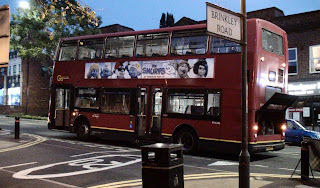 This evening at about half past eight, the 213 bus heading up Central Road broke down opposite Brinkley Road and was still there an hour later, and could possibly still be there now. The driver told the blog that the catalytic converter needed replacing and although it was an easy thing to replace, they couldn’t get under the bus to do it while it was on the road. He was therefore waiting patiently for the bus tow truck to come and take the bus away to where they could get underneath and fix it. In the meanwhile cars have had to drive around the bus in central road (nothing new there) and are also having to squeeze through the tiny gap left by the bus to get into Brinkley Road. Getting out of Brinkley Road is another matter. The driver said that he tried to manoeuvre the bus further past Brinkley Road but it just wouldn’t go any further. 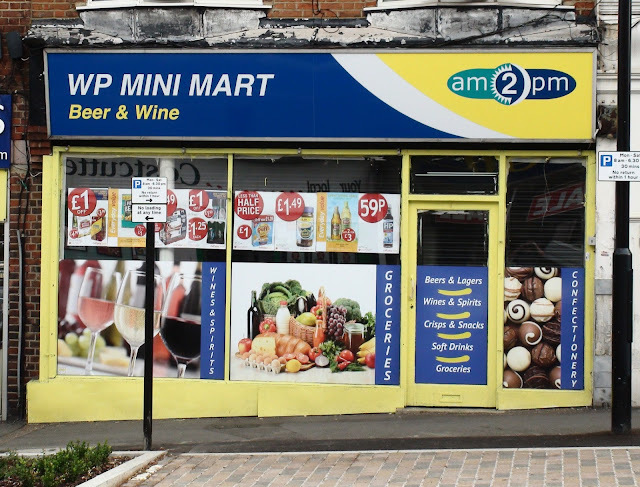 This blog is sorry to report the sad demise of the WP Mini Mart after a brief two month struggle to survive in Central Road. The ‘Mart as it had become fondly known closed its doors for the last time after a final day’s trading on Monday the 22nd of July just a little over two months after opening its doors as reported by this blog. 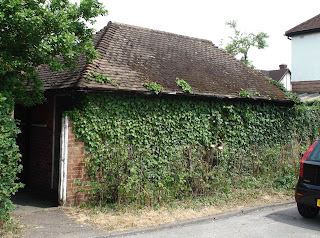 The blog understands that the owners had been given 6 months rent free to help grow the business but even that wasn’t enough to keep the doors open. This blog is always sad to see independent businesses go under but would like to suggest that the future tenants take into account a couple of what I think are basic principals before pouring their life savings into a new venture. Don’t just offer the same stuff already available in half a dozen other shops within 100 metres. If people want to buy that stuff they will go where they have been going for years already. Fill your shop. Nothing screams ‘temporary’ more than under used space in a shop. One drinks fridge, a couple of shelves and stands along the walls and a sweet counter in front of the till doesn't look or feel like a ‘complete’ shop. Nor does it make me want to come in and find out what interesting things I might discover in there. I hope this doesn’t come across as patronizing but I am sick of seeing shops open and then close so quickly. Having once run a small business myself I know how much people have to invest personally as well as financially to try to get any business off the ground and of course they lose all of it with no compensation if the business fails. The extended family of Irish Travellers who graced the Worcester Park Tavern with their presence (and their rubbish) back in April has had a go at moving to Manor Park this evening (Tuesday - now technically yesterday evening). The only thing is that the police managed to get there before they could get all their caravans in and so while four caravans have set up house at the back of the park, the others were turned away at the gate by the police. 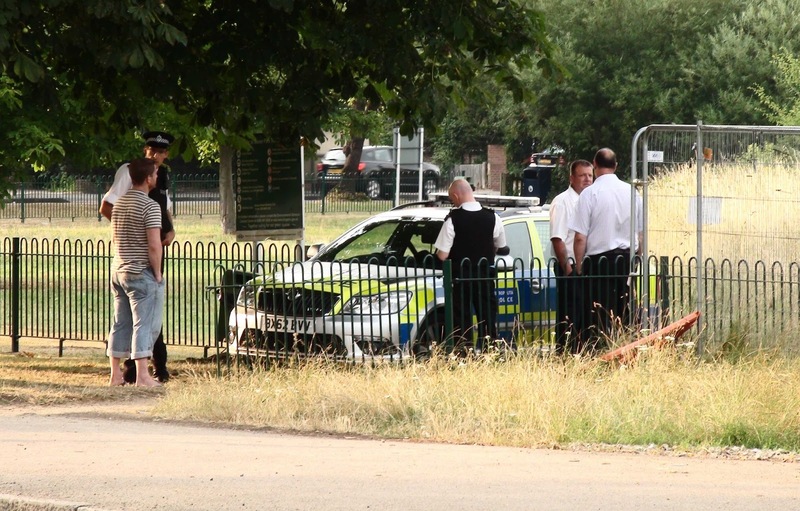 Council officers from the London Borough of Kingston upon Thames, in whose area the park is, have now taken over guarding the entrance to the park in Malden Road but there is still a police presence within the park grounds. 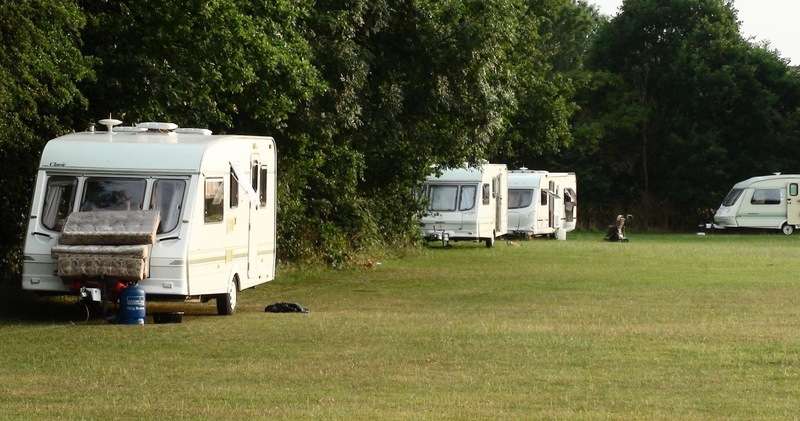 The travellers told the blog that people should respect their privacy and that it was their custom to live this way and we should not object to them staying there. They were generally friendly in a slightly menacing sort of way. I couldn’t help being glad the police weren’t too far away! You may have read it in the Kingston Guardian already but just in case you haven’t, the travellers in Manor Park were moved on. They were escorted out of the park and out of Kingston borough by police at around 11pm on Thursday evening (25th July) using section 61 powers. The owners of the Hawthorne Woods attached to the park and who have flattened the area, apparently for allotments, are being blamed for letting them in to begin with because they apparently removed a council fence allowing the travellers to drive their caravans into a public park. The council is considering suing the owners. 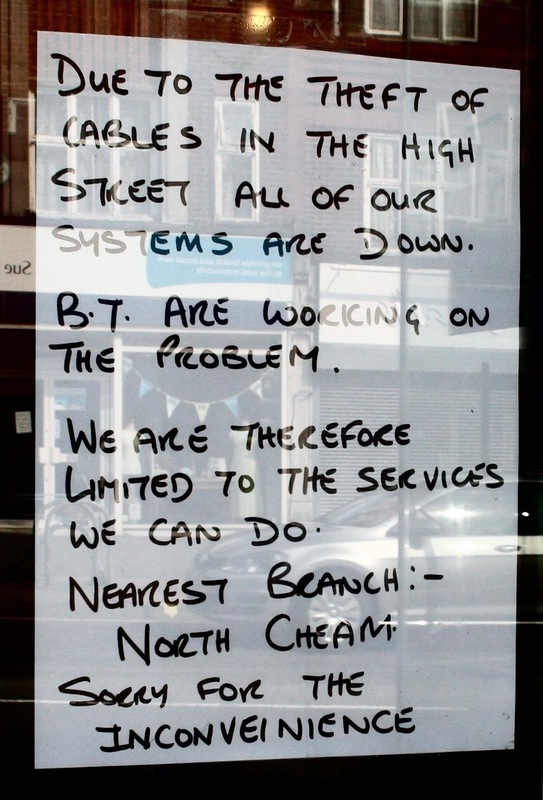 Yesterday this blog reported the cut cables in Central Road affecting local business. A BT engineer arrived this morning to have a look and report back on the situation so it can be assessed and the next step determined. 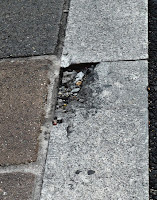 Jovauehn Henderson from BT told the blog that having seen what was cut, people at head office needed to determine whether the pavement needs to be dug up or not in order to replace the cables. There are cables going in three different directions. In some cases it might be just a matter of pulling new cable through existing conduits but this can’t be determined until the plans have been looked at. It also depends on if there has been any internal damage to the conduits. Several cables were cut but it seems none were actually stolen however there is not enough protruding cable to just join them back together safely so new cables will need to be pulled through. The work will need to be done either by a secondary BT team or by a contractor. According to Jovauehn, if it is determined that the work will be easy and they get a secondary team out quickly, it might be finished by tonight or more likely tomorrow. 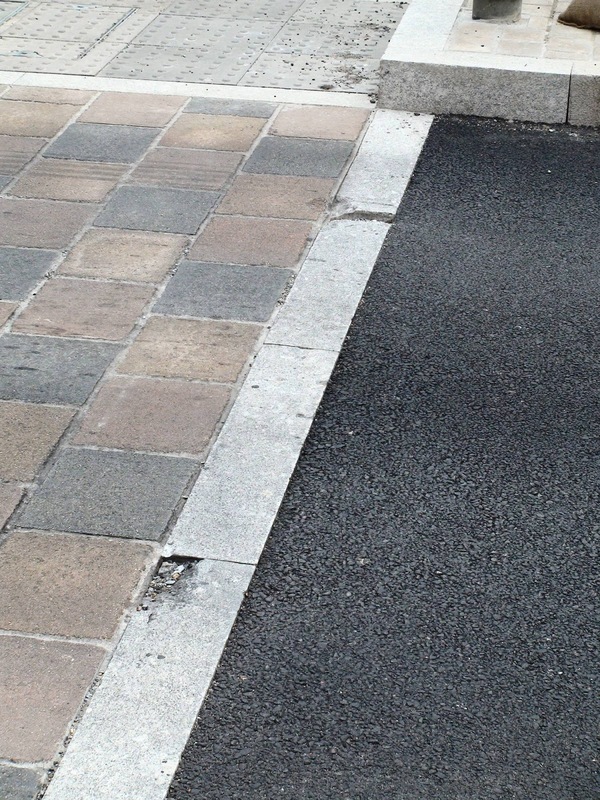 However if they find they need to dig up the pavement to re-lay conduit and cables it could take over a week, especially as planning permission is needed from the Council before they can start. It has been suggested that just cutting the cable is a strategy often used by cable thieves. Sometimes they cut the cable first and then leave quickly because it triggers off alarms and can bring police down to the site. Then they come back later once it’s all quietened down to finish the job. 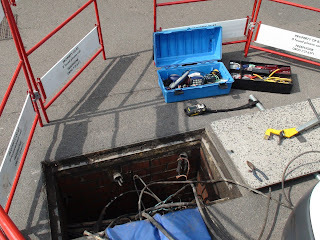 We probably all want to be vigilant in watching for anyone going back and stealing the cables but this gets a bit tricky because genuine BT workers and contractors will be doing very similar stuff. Jovauehn told the blog that everyone working on it must have an ID tag but that criminals often produce their own ID and some even go to the trouble of getting vans painted up as BT vans so nobody questions them. He said only a manager who knew the actual people and knew what teams were working where would really be able tell a real engineer fixing the problem from a bogus one stealing cable. Although the number plate of the van would give it away if this was checked. Meanwhile Pizza Express are making do with a manual system as they have no computer system. They have organised their phone to be diverted to mobiles so you can still order and book. 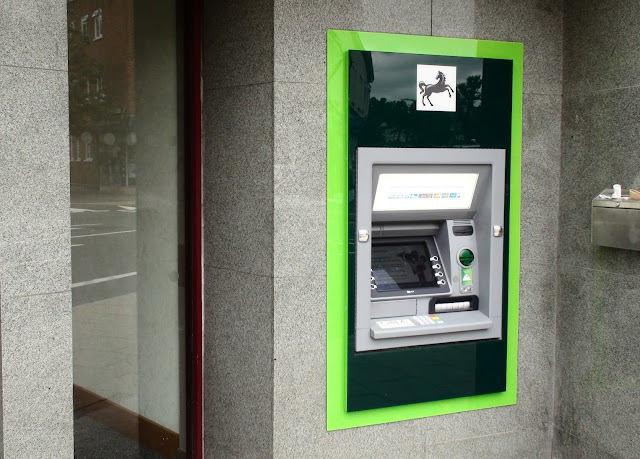 The two banks are open but very limited in what services they can offer and the residents above the shops are without telephone or internet. Hopefully it won’t take too long to fix. Status: Mostly fixed. 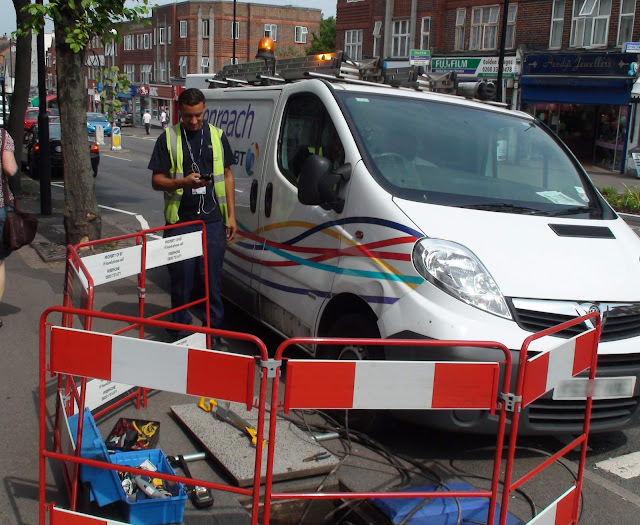 BT turned up yesterday (Thursday 25th) and managed to get services up and running again to the affected businesses. 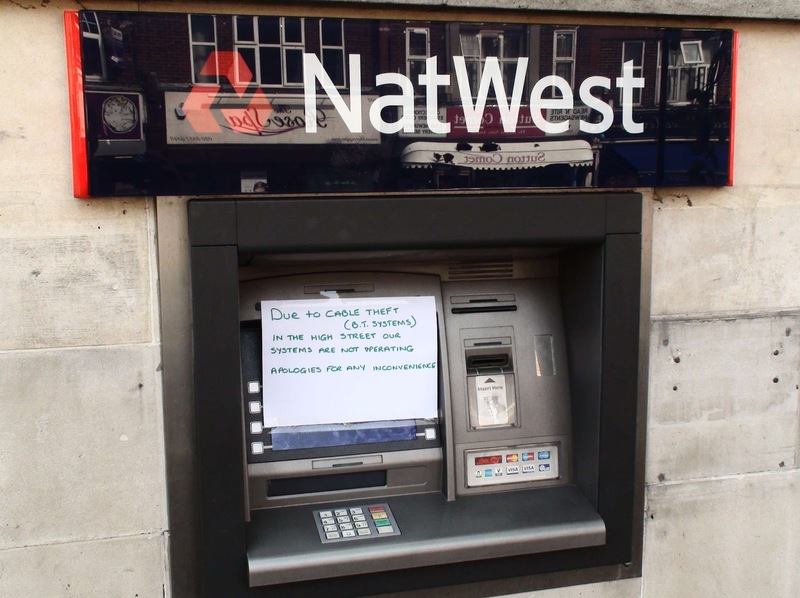 Natwest had all but their telephones restored around lunchtime yesterday. 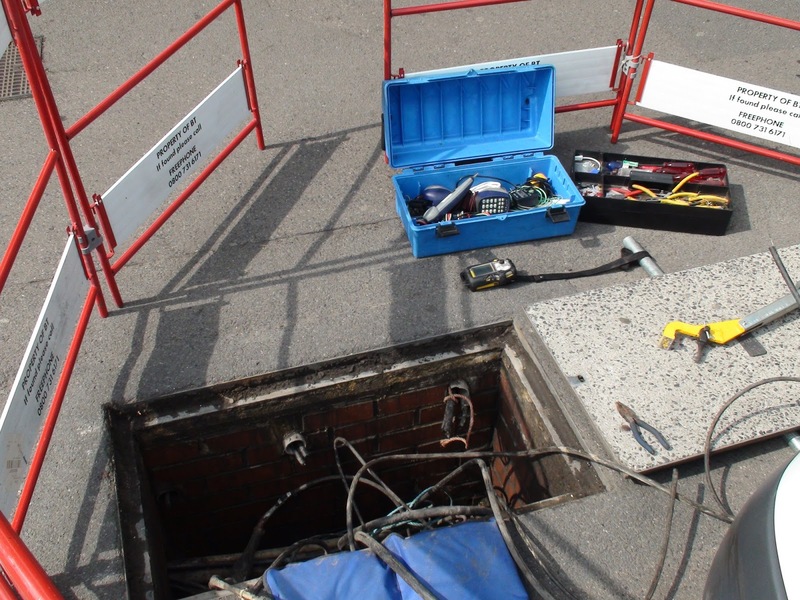 They are hoping to be connected to the telephone network again soon. Pizza Express had all their services restored around 4pm but the phones were intermittent. BT came back this morning to sort that out. Luckily it seems no digging up of the pavement was required. A hand full of businesses in Central Road have lost their internet and telephone services due to a cable theft on Saturday morning. Both NatWest and Santander, lost their services at around 11:30 Saturday morning as copper cable was cut and stolen in broad daylight from busy Central Road. 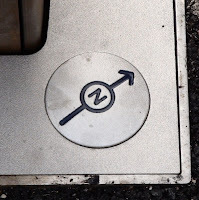 As one of the ladies in a very empty NatWest told the blog, there have been so many road works around the area that people dressed as workmen and taking cable just wouldn’t be noticed. BT have made it a priority to fix the cable and hope to start tomorrow (Tuesday) morning although they have had to apply for planning permission to do the necessary digging. It is likely to take at last half a day. It is hoped then that services will be up and running again tomorrow afternoon at best. Thanks to blog reader Sue who first spotted this (or at least let me know!). She asks: "Along the same line do you think Papa Johns would give me loads of pizza if I turned up outside with a moped with a box on the back?" 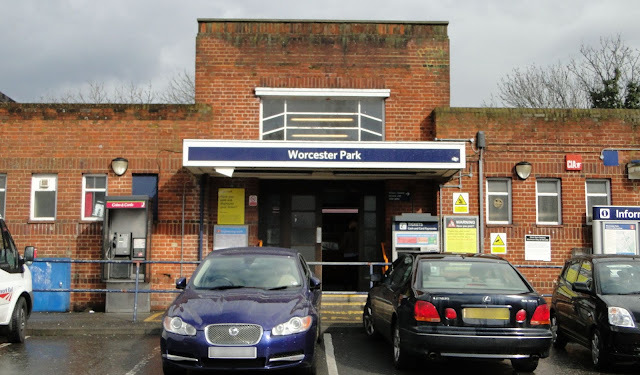 As many readers will know, Worcester Park station is at the beginning of a major upgrade at the moment and may be a station stop on the planned Crossrail 2 project. 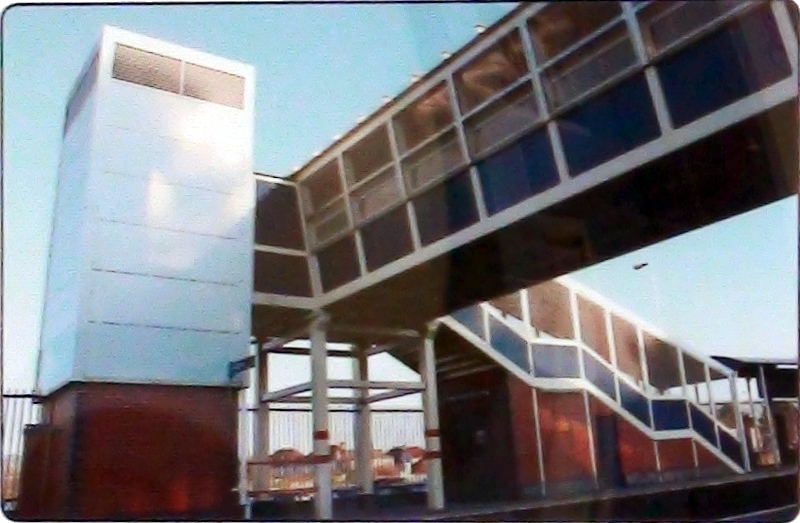 The upgrade began with the platforms being extended down the ‘other’ end and work is set to begin tomorrow morning (Monday 21st July) on the ‘Access for All’ works which will involve building a new footbridge with lifts and ramps and should be completed next March (2014). Anyone who normally parks at Worcester Park station should note that several parking bays will be suspended during the construction works so don’t expect to find a space as easily. 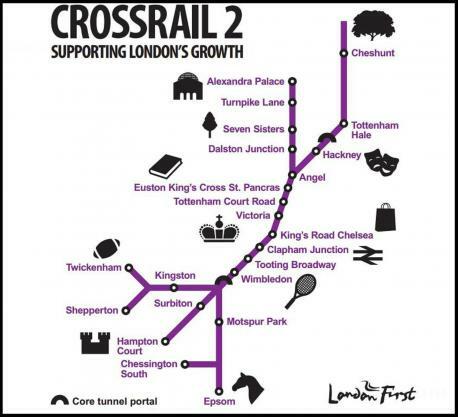 on the platform and wave to the Crossrail 2 passengers as they speed through the station on their way from Motspur Park to Epsom or Chessington South, however that may be about to change. 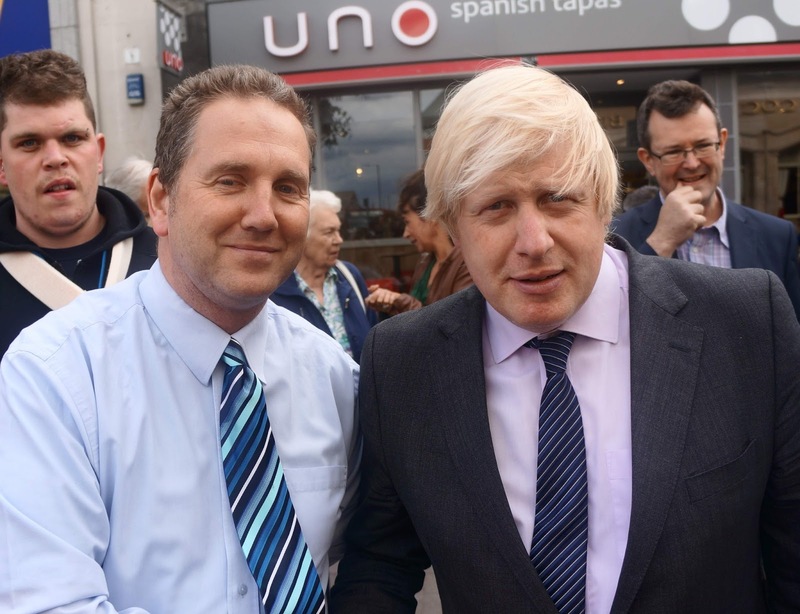 Mr O'Connell also pushed for the tramlink to be extended so that it connects Worcester Park and Sutton. (If you’re very interested you can read the transcript yourself here - the important bit starts on page 14). 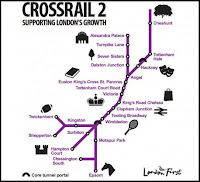 As part of the consultation, the London TravelWatch Board will be meeting this Tuesday (23rd July) to discuss (amongst other things) the proposed Crossrail 2 scheme. The meeting will go from 9.30am to approximately 12 noon. The agenda and papers for the meeting can be found here. You can follow live tweets from the meeting using the hashtag #ltwboard. You can also use this hashtag to send them comments on the proposal. Pressure has been brought to bear from other quarters too. 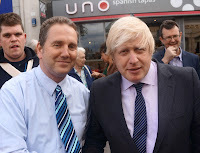 Wearing my Local Tory campaigner hat I have been lobbying Mr O’Connell about this and took the opportunity to bend Boris's ear in Sutton a few weeks ago, telling him that "Crossrail 2 trains need to be stopping at Worcester Park." Sutton Council have also said they want Crossrail 2 trains to stop at Worcester Park. From the surface the work looks completed (as shown above). However it needs to be properly inspected before it can receive the rubber stamp of finishedness. A couple of hundred metres up the road a team from Thames Water and Metrorod are preparing to do just that. 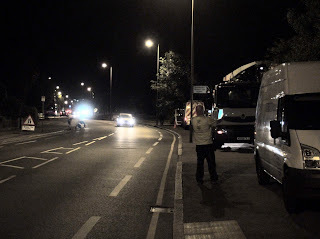 By now (just after midnight Friday night/Saturday morning) they will have switched on their own set of two way traffic lights more or less opposite St John’s Church Hall, and started the job of pushing a camera up the pipe to see from the inside if it really is fixed. The gentleman in charge told me that this is not a quick job, it needs to clean as it goes and will probably take all night. 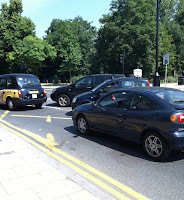 They were just waiting for the traffic to subside before starting so as to keep disruption to a minimum. If they find that the pipe is indeed fixed properly then they will take away all the traffic blocking stuff and 4 way lights etc. as quickly as possible. My original fear that they hadn’t quite finished by 5pm so decided to leave it all up for the weekend to come and take it all down on Monday morning was thankfully refuted. Of course if they find it is not fixed properly then we are going to have to grit our collective teeth for a little longer while they do it all again. Hopefully this will not be the case. Phew! Well it all seems like it was fine down there because this morning they came and packed away the automotive obstacle course and cleared the road so we can all enjoys our trips to and from Kingston, New Malden and the A3 at 3 mph again rather than 0.3 mph. Happy days! There are a a couple local events going on tomorrow (Saturday 20th July) in and around Worcester Park so I thought I might mention them here. 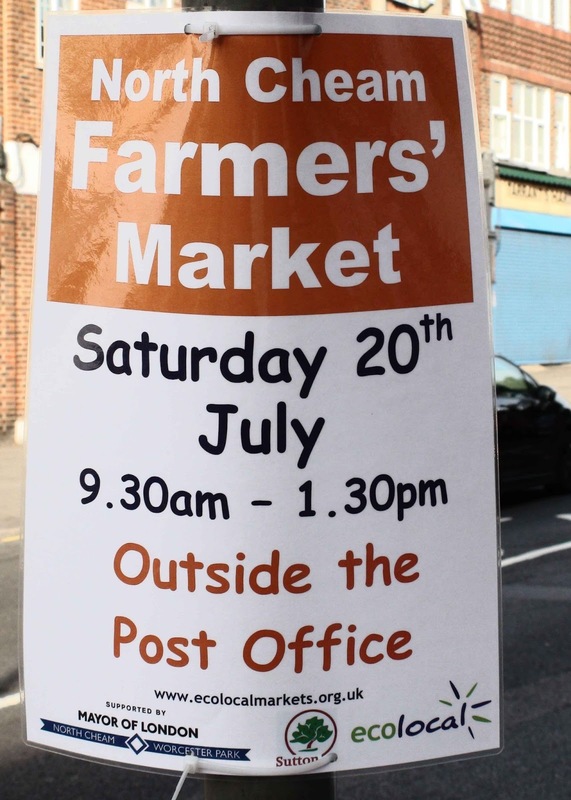 Firstly going on up the Road in North Cheam from 9:30 until 1:30pm is the regular Farmers Market. 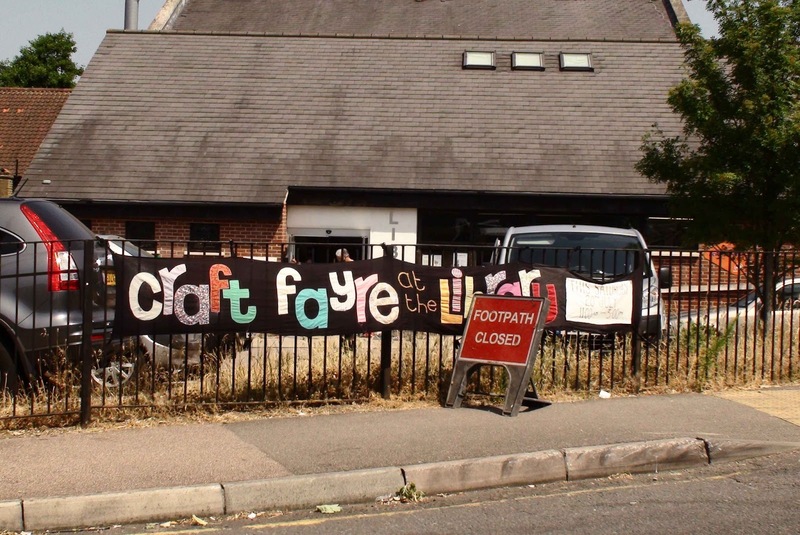 And from 11 until 3pm there is Craft Fayre at Worcester Park Library. If I have left any other events out, please let me know! 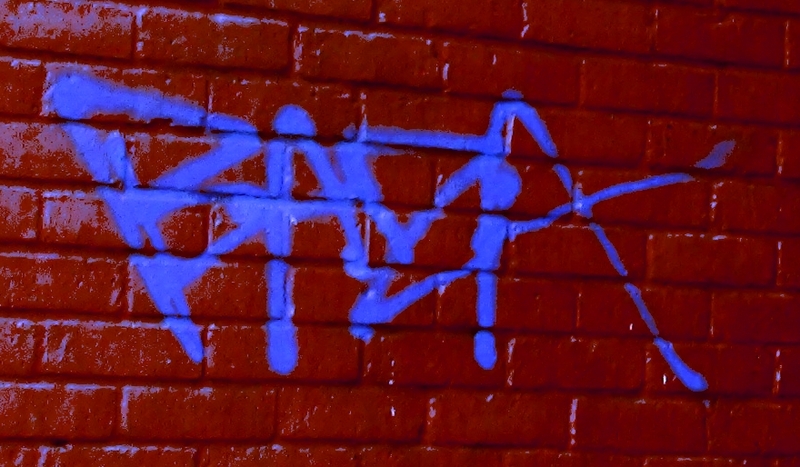 If there’s one way to lose my respect pretty quickly it is to tell me you are a graffiti ‘tagger’. 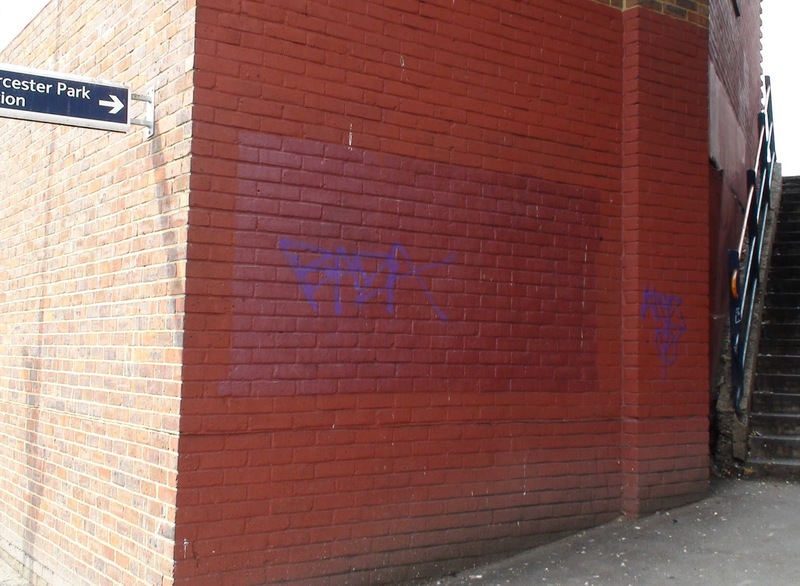 The only people who like seeing it are the taggers themselves getting their little ‘thrill’ out of seeing their own tags and hopping other taggers will notice and recognise them. For everyone else it is right in that place where immaturity, arrogance and contempt all overlap. 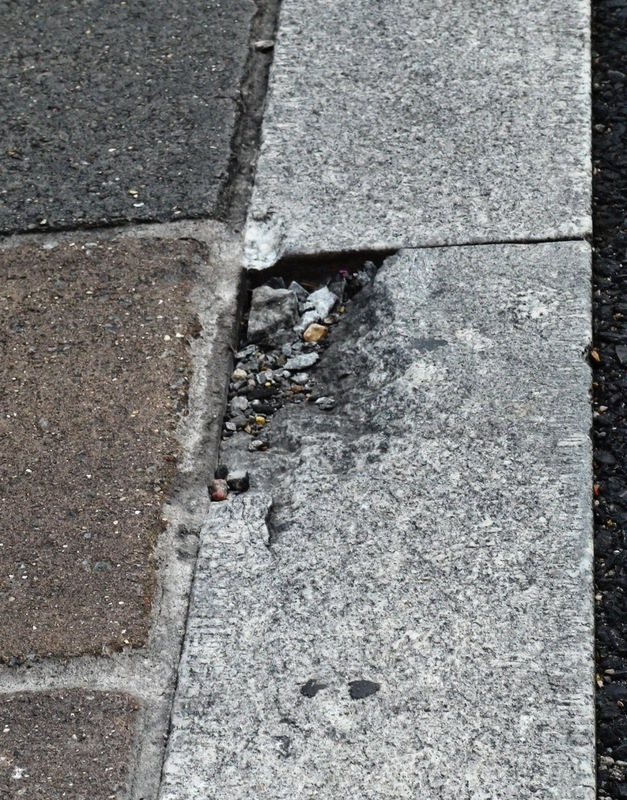 It is right up there with fly tipping for quickly altering the character of an area in a harmful direction, possibly even worse because it is harder to get rid of, easier to do and is done with intent rather than for convenience. I don't mind the artistic stuff when there is obvious talent, but the shabby repetitive scrawls are of no benefit to anyone. I hope this is not a sign of things to come and that this is painted over very quickly so as not to attract similar vermin. (Yes - I really don't like them.) 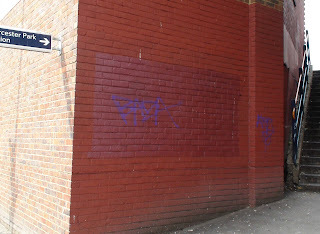 Let's not let Worcester Park decline into one of 'those' graffiti ridden areas. If you see anyone doing this it is a ‘crime currently being committed’ and so calling the Police on 999 is justified and advised. If you know anything about who has done this please call 101 to let the Police know or you can let them know anonymously by calling Crimestoppers on 0800 555 111. Well there’s good news and bad news. The good news is that the large hole in the road outside Worcester Park Station is being fixed. The bad news is that it is causing traffic mayhem of an order of magnitude greater than just the usual traffic mayhem. Work began at around 11 o’clock this morning and is scheduled to be finished tomorrow evening. 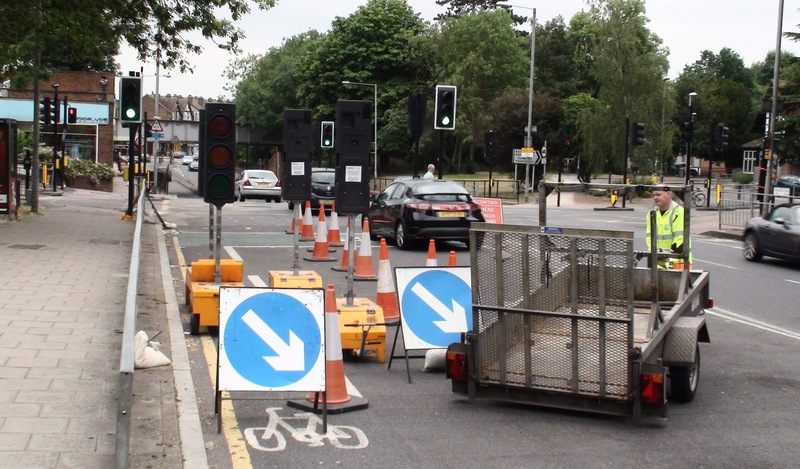 A four way temporary traffic signal has been put in place and all the crossing points over Malden Road to the station have been closed. 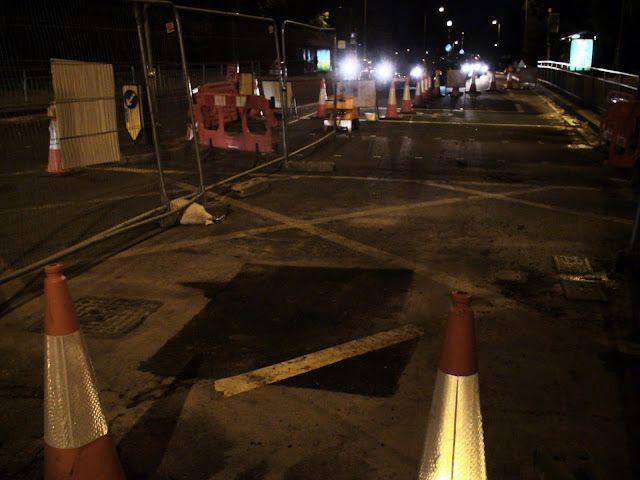 The hole, which is the result of a collapsed sewer, opened up at the beginning of last week and it has apparently taken this long for Thames Water and Metrorod (the contractor doing the work) to get the necessary permission from the two local Councils and the other various necessary bodies to start the work of digging up the road and replacing the pipe. According to the gentleman who was supervising their lunch break today (or it might have been a tea break) it takes that long for all the paperwork to go through the system. The resulting traffic was banked all the way up Cheam Common Road as far as Farm Road when I went past and this was at a usually benign part of the day traffic wise. This in itself has led to 'yellow box' hogging at Green Lane and incidents of shouting a swearing at other drivers (is that classed as road rage?). I don’t know if it was a coincidence or because all the cars were stuck in the traffic but Stone Place Car Park was the emptiest I have ever seen it during the day. I would encourage everyone driving to avoid the area until the work is completed. 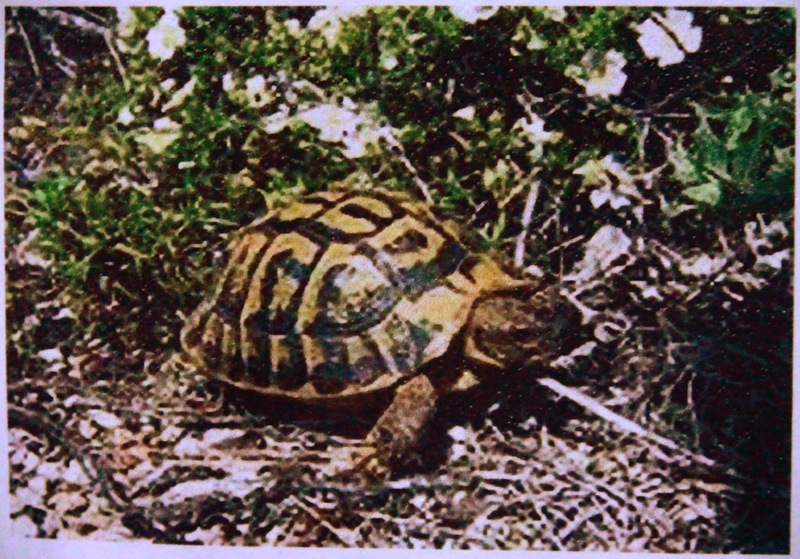 Thanks to a blog reader for some of the photos! 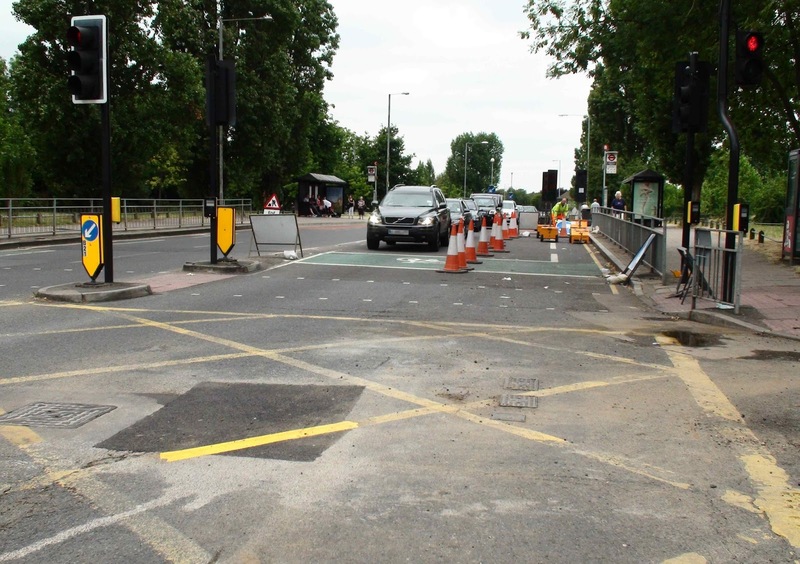 Thanks to a blog reader who reported that the hole was filled in by around 4pm. 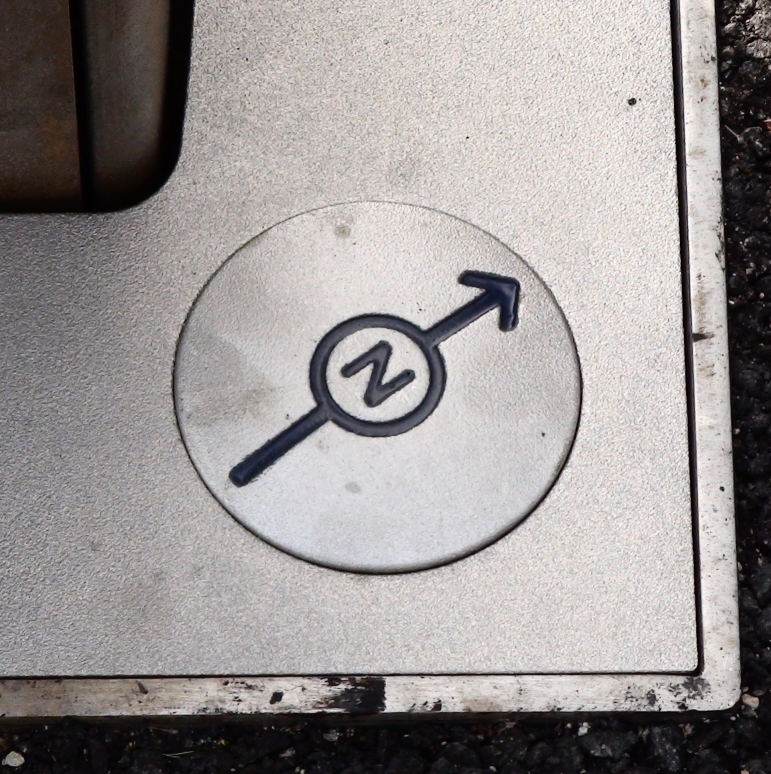 I went past at about 4:20 and noticed the yellow line had been repainted on the patch. So fingers crossed it won't be long. The weirdest thing was that this afternoon Central Road was almost deserted. It looked as if it was a bank holiday. All the traffic is stuck on the other side of the road works snaking its was down Malden Road so very little can actually get through into Central Road, leaving it like a ghost town. 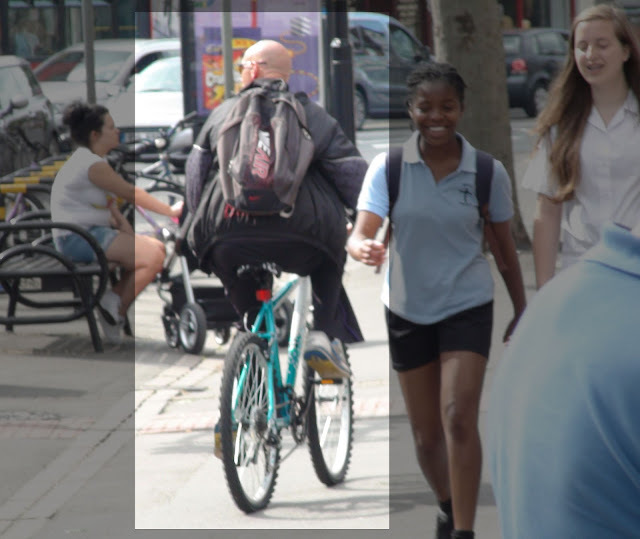 A week ago I was a victim of what seems to be an increasing problem in Central Road - that of adult cyclists riding at speed along the pavement. While I was not hit, it was a little close for comfort, and the footpath was fairly busy, meaning anyone of the pedestrians going about their daily business could have been hurt. Luckily I had my camera at the ready and managed to snap the above picture before it was too late. Coincidentally I was looking through the letters page on the Sutton Guardian website earlier today and saw a letter from a concerned Worcester Park Shopper who was nearly knocked over by "6 youths aged about 18 years old, absolutely speeding down the pavement weaving in and out of pedestrians" as they rode down towards the Midas Touch pub and round the corner out of sight. Do you think this is becoming a big problem in the area? And does anyone know who it as that I managed to snap last week? 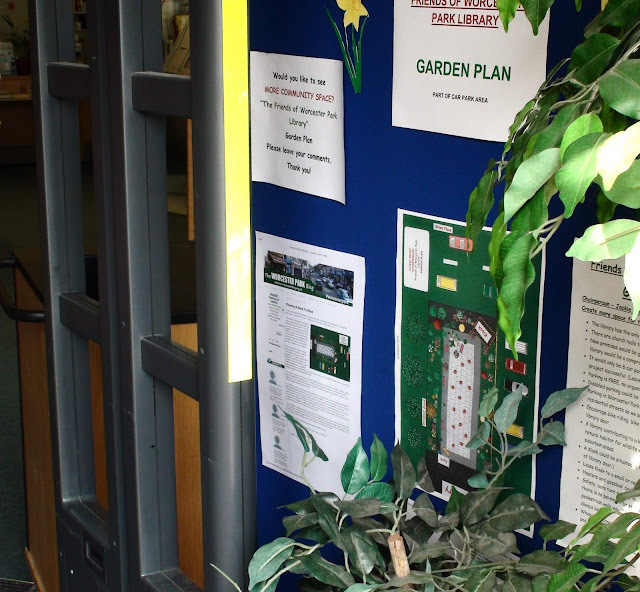 I was flattered to see the blog being exhibited in the library the other day as I walked in. Understandably it was the story about them trying to turn the top section of the car park into a Library Garden and was part of a display about the proposal, but it was very cool to walk past and see my work put on display at the entrance there. 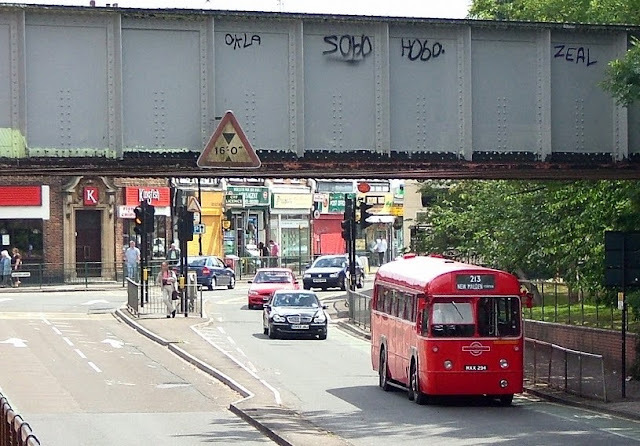 One thing I would like to hope about all this money being spent in Central Road is that the people who are being trusted to make the decisions have the relevant knowledge and experience to get the engineering stuff right. 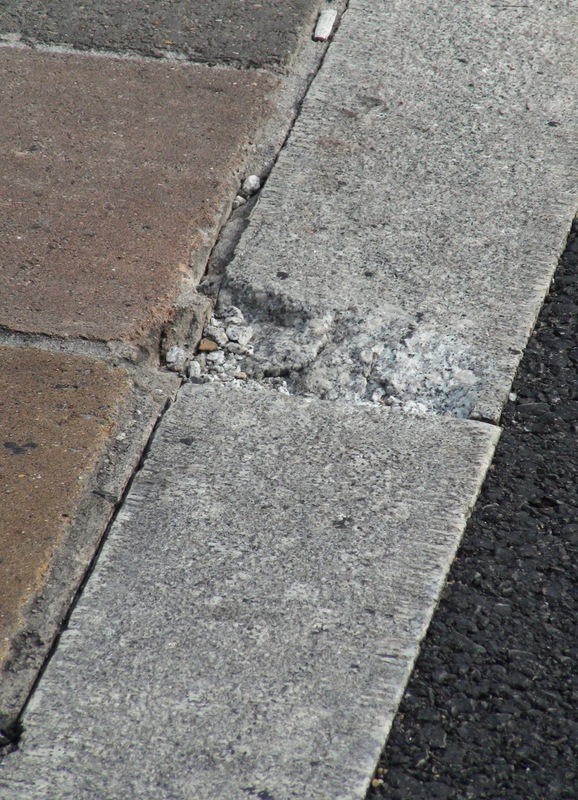 "The two new crossing that they just finished building outside Rumours and by Balmoral Road already have cracks in the materials.... What’s it been, 10 days before the cracks begin to show? Shoddy isn’t the word!" It would be understandable if only one of the new crossings was breaking up as this could be down to a specific flaw in those materials or that part of the road. But for both crossings, at about the same position and after only a month? This would suggest to me a serious lack of the understanding required by the decision makers when designing or implementing these crossings. This begs the question, how many other aspects of these Central Road improvements will start to fall apart before long? And why hasn't this been managed properly? Is it even being managed properly now? It’s great that it looks nice but to spend a million quid for something to look nice for a few months and then fall to pieces and be an eyesore for years until someone else fronts up another million quid doesn't strike me as being the very best value for money. Blog readers may recall that Steve O'Connell, our London Assembly member was looking into whether the 213 bus could once again become a night bus all the way through to Croydon. The Blog can reveal that, having received feedback from many quarters, Mr O'Connell sent a letter last month to Sir Peter Hendy, the Commissioner for Transport asking that the N213 bus be reinstated, saying that as this was the only public transport route at night between Sutton & Croydon from Kingston, a gap in public transport at night had opened up in the area. 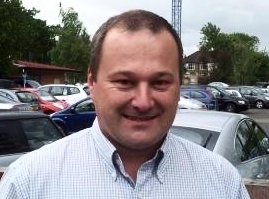 He argued that the feedback he has received attests to the fact that the N213 was in fact a busy bus route, offering young people a cheap, safe and quick method to get home from a night out in Croydon, Sutton or Kingston and furthermore, it clearly offered a safer means of travel for women than using an illegal mini-cab service, a taxi now being the only way to commute between these three locations at night. Mr O'Connell also made the point that bus passengers have found the old N213 service a cost effective means of getting from Worcester Park to East Croydon station and thence on to Gatwick, in order to catch early morning flights as the cost of an Oyster card payment weighs favourably against a £35.00 taxi fare. In the reply that Mr O'Connell received back from Leon Daniels, the Managing Director of Surface Transport for the Mayor, Mr Daniels stated that the average overnight usage of route N213 between Sutton and Croydon was approximately 60 trips per night on weekdays and 120 at the weekends which approximates to 30,000 journeys per year. By contrast, the Kingston to Sutton section was carrying around 60,000 passengers per year. 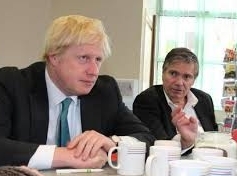 He said that if the 213 night service to Croydon was re-extended, this would require an annual subsidy of £140,000 of public funds, representing a subsidy of over £3.50 per additional passenger trip and unfortunately this cost could not be justified. Mr Daniels did however say that they are mindful of the calls for more night-time services and are looking into whether a less-costly option is available. 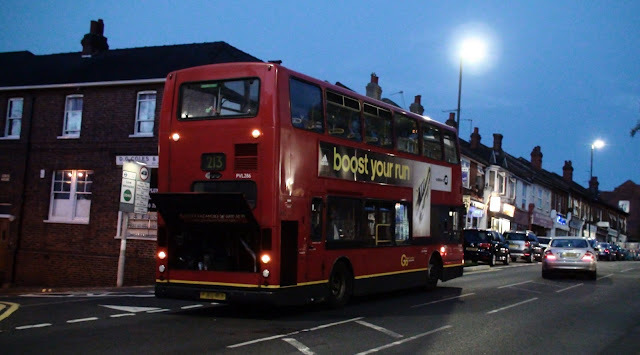 One possible option they are considering is to run some later journeys on the 154 route, as this also links Croydon and Sutton, and currently has its last departure from Croydon scheduled for half-past midnight. So it would appear unlikely that we will get a night bus all the way through to Croydon from Worcester Park but we may be able in the future to change at Sutton for a similar service.